Clean and satisfying tomato and cucumber salad inspired by the farmers market, with fresh basil, lemon juice, olives and sea salt. Spring is here! I love simple chopped salads like this when the weather starts to warm up and my body craves cool, clean foods. This is my favorite type of meal to make when I get home from the farmers market and I have a bag full of fresh, crisp produce just begging to be eaten. This little salad is light, nourishing and clean. This past week a sweet woman at the farmers market gave me two whole bunches of these gorgeous orange and yellow flowers with edible petals. What a luxury! I added them to this salad for a pop of beauty – if those tomatoes weren’t beautiful enough. Lately I’ve especially appreciated simple, healthy meals to nourish my body and my mind. I value my quiet moments in the kitchen when I get to prepare beautiful foods, or when I have the honor of creating a meal for someone I love. Cooking is my meditation. My joy. I’ve been bursting with creative energy and I’m grateful for easy and fresh salads like this one. For now, enjoy this Spring Market Chopped Salad. Combine quartered cherry tomatoes, persian cucumber, red onion, castelvetrano olives and basil in a bowl. Toss to combine. Squeeze lemon juice over the salad, add olive oil and sprinkle with salt and pepper. Taste for seasoning and enjoy! You can eat this salad as is, spoon it atop crisp-tender butter lettuce (my favorite! ), or have it as a side along with fresh grilled fish. What’s your favorite Spring recipe? Share in the comments, I’d love to know! Oven-roasted Campari tomatoes with garlic and fresh herbs. Late season tomatoes have been on sale around here, but they don’t seem to have the same burst of flavor as juicy summer tomatoes. That didn’t stop me from grabbing a basket of Campari tomatoes when I eyed them on sale. I also brought home a beautiful spaghetti squash and since I already had the oven on to roast the squash, I decided to throw the tomatoes in too – why not?! The garlic, scented oil and herbs from the roasting pan combined with the tomatoes to create a lovely flavor-packed sauce that I’ll be craving long after it’s gone. I borrowed a lot of inspiration for this recipe from David Lebovitz. I tend to trust anything he makes, so when I was trying to decide which direction I wanted to go with these tomatoes, I stumbled upon his recipe. He happened to use exactly the herbs that are abundant in my garden right now along with fresh garlic, which was just what I was thinking. I let this batch of tomatoes tag along with the spaghetti squash in the oven. My oven was set at 400 degrees F and I put the tomatoes in for about 15-20 minutes at the full temperature, and then I turned the oven off and left the tomatoes in for about an hour, or until my oven had finished its cool-down process. Pre-heat your oven to 400 degrees* (if you are not already using it for something else). 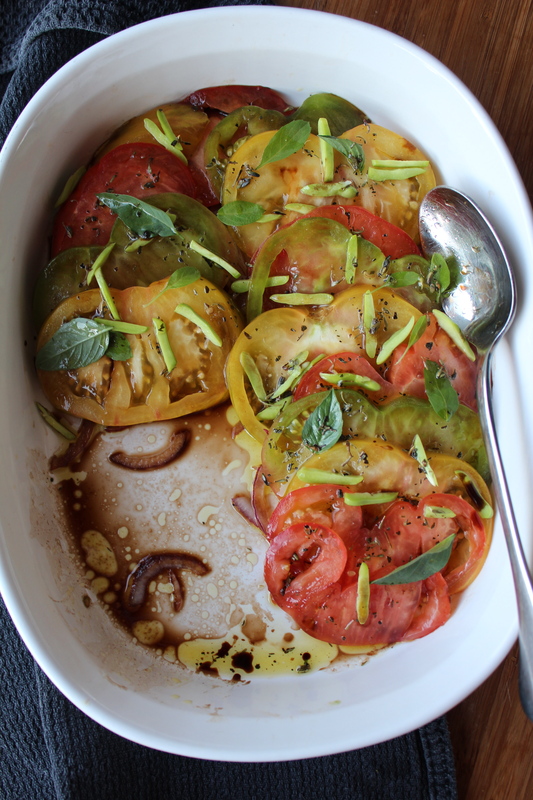 Spread the olive oil in a baking dish large enough to fit all of the tomatoes. Be sure to cover all of the corners and sides of the baking dish. Wash and dry the herbs and lay them in an even layer on the bottom of the baking dish. Next, slice the garlic cloves. You can use more or less depending on your preferences. Scatter the garlic amongst the fresh herbs. Halve each tomato and place them cut-side-down in the pan and sprinkle with sea salt and black pepper. Place in the hot oven on the middle rack and allow the tomatoes to roast at full temperature for up to 30 minutes, taking care to avoid burning them. Turn off the oven and allow the tomatoes to slow-roast for as long as you like. You can occasionally check on them with the oven light to see how they’re doing, but don’t open the oven and let heat escape. I left mine in the oven for about 15-20 minutes at 400 degrees before turning my oven off and letting them coast for about 45 minutes to an hour. If making tomato sauce – allow the tomatoes to cool enough to handle. Remove any tomato stems and rosemary sprigs from the pan and discard. Dump all of the remaining ingredients into a blender. Use a rubber spatula to be sure to get all of the pieces of garlic and every drop of the olive oil into the blender. Optional: add a few fresh basil leaves. Puree into a smooth sauce. Use immediately, or pour the sauce into jars. Use within a week. *Note: the temperature of the oven doesn’t matter very much as long as you have time to spare. It can be lower than 400 degrees, but it will take longer for the tomatoes to cook.